Adele wrote that her friend's childbirth was "the biggest challenge of her [friend's] life in more ways than one"
In this Feb. 12, 2017, file photo, Adele is seen in Los Angeles. Adele had a message for new moms when she shared the story of her best friend, who suffered a serious mental illness after giving birth to her first child. In a Tuesday Instagram post, the singer urged new moms to "talk about how you’re feeling because in some cases it could save yours or someone else’s life." Adele offered the advice with a photo of herself and the friend, new mom Laura Dockrill. 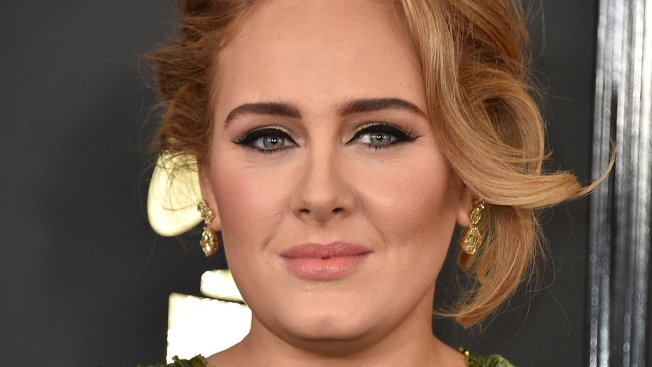 She said Dockrill suffered from postpartum psychosis after childbirth, which Adele wrote was "the biggest challenge of her life in more ways than one." Postpartum psychosis is a rare mental illness that can affect women after childbirth, according to the U.K.'s National Health Service. Symptoms include hallucinations, delusions, mania, depression, restlessness and confusion. It is unlike postpartum depression or other mood changes that can come after giving birth. The NHS says postpartum psychosis should be treated as a medical emergency, and going without treatment could lead to the mother neglecting or harming herself or her baby. Postpartum psychosis affects 1 to 2 in 1,000 women after childbirth, according to the MGH Center for Women’s Mental Health in Boston. In a candid blog post that Adele shared on her Instagram page, Dockrill described her time with the disease as "hell" and said that after she returned home with her newborn, "I felt like I had pushed out my personality as well as a baby." She suspected something was wrong but encouraged herself to "stridently continue" anyway. Still, she wrote, "I didn’t recognise myself and I felt like an intruder in my own life, like a fraud and a complete failure. ... I thought I was going to hurt myself in some horrendous way and I was doing everything to try and avoid that plus I didn’t want my family to see me crumble away before their eyes and watch me turn into an anxious wreck." Dockrill said she couldn't eat or drink, her skin became "so pale it looked blue" and she suffered from severe anxiety attacks. In an interview with BBC's Radio 1 Newsbeat, Dockrill said it was Adele who called attention her severe symptoms. "She recognised it in me," Dockrill told the station. "I was on the phone FaceTiming her and she was the first one to detect what I might have." Adele was the big winner at the 59th Grammy Awards on Sunday, beating Beyonce in the top three categories. With the help of "family, an incredible psychiatrist, medication ... and psychotherapy," Dockrill said she is "healed and recovering more and more each day." "I am happy, confident and strong," she wrote. "I am myself." Along with Adele's advice, Dockrill offered her own: "Take care of yourselves, be patient with others and above all be kind. If anybody is suffering don’t delay on talking to somebody, it can escalate and easily get out of hand." She warned that "mental health is no joke" and that mental illness is "nothing to be embarrassed about."